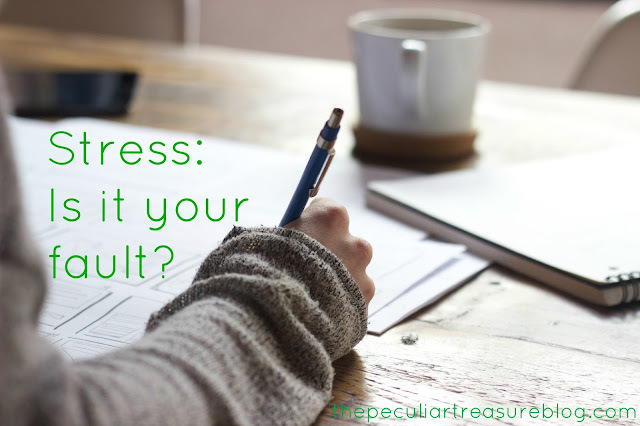 The Peculiar Treasure: Is Your Stress Your Fault? Is Your Stress Your Fault? As I survey people walking down the street, people at the gym, and even people who I am closest too, a majority of them look and act stressed. If you ask someone how they are doing, you'll usually either hear "Tired" or "Stressed". And if they say "tired" and you ask them why, it's most likely because they've been working round-the-clock on something that has been stressing them out. Stress takes you in it's grip, claws out, and squeezes you until your lungs are close to bursting. It takes your emotions and forces them on a teeter-totter, until up and down is all you know. Stress causes physical ailments, and it also causes strain in your relationships. 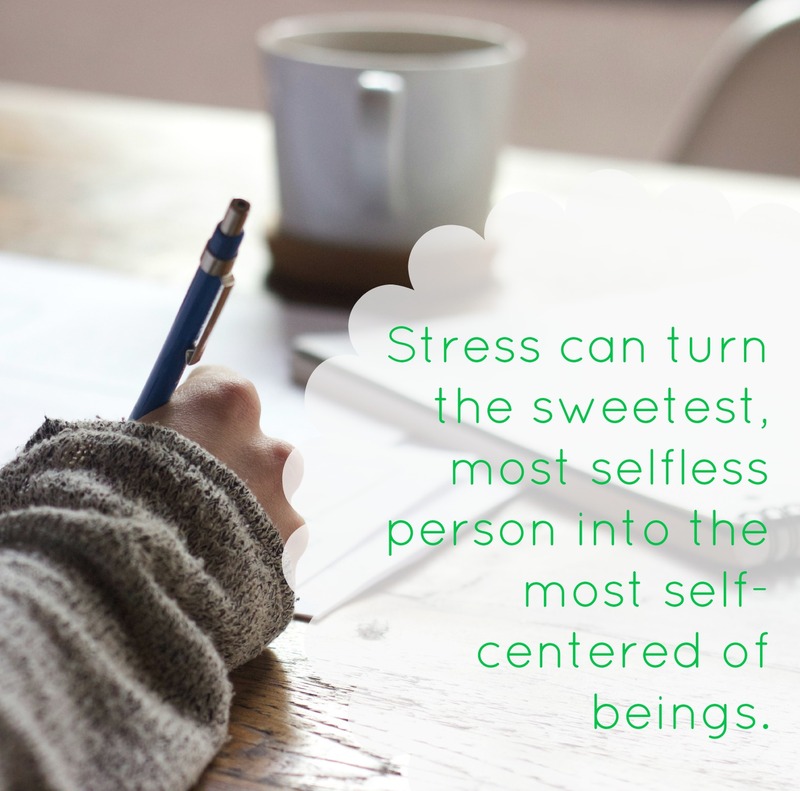 Stress can turn the sweetest, most selfless person into the most self-centered of beings. Our society is so bent on perfection, on getting everything done, and on getting ahead, that they skip over rest of what life has to offer. I believe it is biblical to work hard and to do your best, but we should also be giving our minds and bodies time to recover. Often-times, we are stressed because our focus is wrong. We stress about looking a certain way (i.e. nails, makeup, clothes, body size), which only means we care entirely too much about what other's think and that we are valuing outward appearances more than the heart. We stress about projects at work. Instead of just doing our best, we put pressure on ourselves to do better than our best, hoping to get the next promotion, or to win the approval of our boss. All this proves is that we don't really value hard work so much as we do our status. We stress that there isn't enough time in the day. Have any of us really stopped to ponder that maybe, just maybe, it's not the day that needs to be longer- it's our schedules that need to be shorter? thought that maybe you are doing too much?Some people have to do more than others. A single mom with two jobs who is barely managing to pay her bills probably doesn't have the opportunity to decide "Oh, hey! I'm doing too much. I'll quit a job". Nor can (well, should) she say, "I have too much on my plate. I just won't be a mom anymore". But, unless someone is in a special circumstance such as this, feeling like we don't have enough time in the day is probably our own fault. *Do you have to work 50 hours a week, or are you doing it to get ahead? *Are you really financially struggling, or do you just have to be more frugal than you used to? (Going out to eat 3 times a week and still having plenty to pay your bills with is not struggling. Sorry people). *Did you really have to stay up all night working on that paper for class the next day, or did you spend your day shopping instead of writing? Most of our stress comes from wrong perspective or poor decisions. Not all, but most. I am as guilty as anyone else is. I make poor decisions (socializing instead of studying, watching Netflix for 3 hours instead of writing a blog post, eating fast food instead of saving money for a bill that needs to be paid...), and these poor decisions almost always end in stress. I also have many wrong perspectives... I get stressed about this blog when I don't have the number of views I expected. Instead of being thankful and realizing that I am improving daily, I stress that I am not good enough- all because of my wrong perspective. So, how do we get rid of stress? Do we come home from work and open up a bottle of wine because "we deserve it, after today"? Do we pop another anxiety pill before we walk into work? Do we drink a pot of coffee and stay up all night working on a project? No. No. And no. Getting rid of stress, in most cases, requires right priorities, right perspective, and responsible decision making. Much of our stress is our own fault. My challenge to all of us is that we examine our lives. First of all, in what areas of life are we stressed? Secondly, why are we stressed? Could we have prevented that stress? How can we avoid repeating the situation? Some stress is inevitable, and not everyone who is stressed is doing something wrong or making bad decisions. Realize that some people have it harder than others and give grace to all. Remember, we are focusing on improving ourselves, not trying to tell others what they are doing wrong. But, before we spend another breath complaining about there not being enough time in the day, and before we snap at our spouse again because "we are stressed and they are annoying us", let's take a look at our lives and make sure that we aren't to blame for the stresses that plague us. I really like this post and I think it has a LOT of truth. And sadly those poor choices often become habits... for example procrastination and then you're constantly late and stressed because you can't get ahead. Or like with my family they hold onto stuff (clothes, knick knacks etc) to the point that cleaning is a struggle which then makes them stressed trying to do it and stressed because they can't get it done. The list can go on and on. Our stress level is often our own fault, way more than we'd like to admit. I mean, sometimes stress just comes, whether we didn't anything to "deserve" it or not, but I personally know that almost all of my stresses are my own fault. Robin, you are very welcome. I am trying really hard to be conscious of if my decisions will have an outcome of stress. When I first got married, I was working 2 part time jobs. This left me with one day off/week and arriving home every day at the same time as Husband. It was exhausting and stressful. After a car accident, I had to get rid of my jobs due to injury. My shoulder is better now but we've learned that our life is much more enjoyable with me home at least part time. I have time to do ministry, write my blogs, work around the house, babysit, and assist homeschool families. I love the relaxed pace even if it means less spending money. That sounds like a wonderful life now! I am sorry you had an injury, but it's awesome how God gets us right where we need to be! Thank you Kristin! Your post was all i needed right now.